To recline the seatback, lean forward to take your weight off it, then pull up on the recliner control lever at the outside edge of the seat. Now lean back until the desired seatback angle is achieved. To lock the seatback into position, release the recliner control lever. Riding with a reclined seatback increases your chance of serious or fatal injuries in the event of a collision or sudden stop. 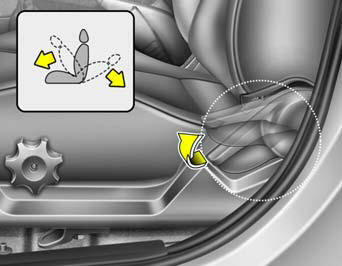 The protection of your restraint system (seat belts and airbags) is greatly reduced by reclining your seat. Seat belts must be snug against your hips and chest to work properly. The more the seatback is reclined, the greater the chance that an occupant's hips will slide under the lap belt or the occupant's neck will strike the shoulder belt. Drivers and passengers should always sit well back in their seats, properly belted, and with the seatbacks upright.